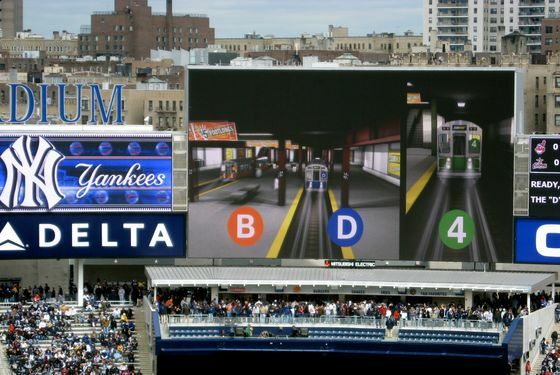 For the first five games of the season, the fourth-inning scoreboard subway race at Yankee Stadium featured not the B, D, and 4 trains, but trains called Road Gray, Midnight Blue, and Pinstripes. According to this morning's Daily News, the MTA had allowed the team to use its train's names as long as the segment wasn't sponsored by another company. And so when the Yankees brought on Subway — as in the sandwich shop — as a sponsor, the MTA contacted the Yankees to discuss a potential change in their arrangement. It turns out, though, this wasn't so much the case of the MTA looking to cash in, as much as it was the Yankees maybe assuming the MTA wanted to cash in. But fear not, subway aficianados: Word came this afternoon that the Yankees and the MTA have indeed reached an agreement, and that the race should be back to normal for tonight's game against the Twins. Now, perhaps, they can get to addressing the real problem with the race: Why in the hell is the D train logo blue?